United States' Ashton Eaton celebrates winning the gold medal in the men's decathlon during the athletics competitions of the 2016 Summer Olympics at the Olympic stadium in Rio de Janeiro, Brazil, Aug. 18, 2016. Two incredible athletes cemented their status at the top of their sports at the Rio Olympics on Thursday night. Ashton Eaton won the decathlon on Thursday night, stamping himself as the "world's greatest athlete" for the second straight games, while Usain Bolt won his third straight gold in the 200 meters. Eaton held off France's Kevin Mayer in the final event, the 1,500 meters, and finished with 8,893 points. Mayer had 8,834 and Canada's Damian Warner was third with 8,666. 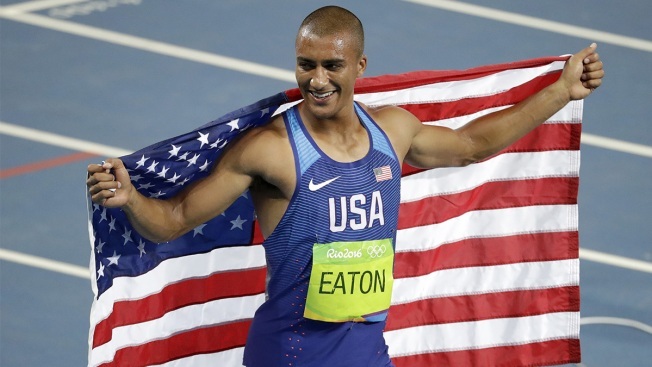 The 28-year-old Eaton won last year's world championship with a world-record 9,045 points. Bolt grabbed an early lead in the 200m and never let it go, winning with daylight. Canadian Andre de Grasse came second; Christophe Lemaitre took bronze. Dalilah Muhammad won the 400-meter hurdles, and American teammate Ashley Spencer got bronze behiind Denmark's Sara Slott Petersen. Muhammad won the USA's first Olympic title in the event since women began running it in 1984. In the men's shot put, American Ryan Crouser beat teammate Joe Kovacs for the gold medal, with an Olympic-record heave of 22.52 meters that topped Kovacs' 21.78. Both train in the San Diego area. New Zealand's Thomas Walsh got bronze. The US women's 4x100 relay team qualified after a protest got it reinstated following a dropped baton in the heats. Officials ruled that Allyson Felix had been jostled by another runner and allowed the U.S. to race for a qualifying time alone on the track. They made it easily. In the men's 4x100m relay, the United States, China, Canada, Japan, Jamaica, Trinidad & Tobago, Great Britain and Brazil qualified for the final. The Dominican Republic was disqualified due to a false start. American Kate Grace qualified for the final of the 800 meters, along with 2012 silver medalist Caster Semenya of South Africa.